April 13-15 is the Lunar New Year of Laos, Cambodia, and Thailand. On 13 April, in order to create the atmosphere of the New Year, international students from Laos, Cambodia and Thailand and representatives of Chinese students from GZMU held a special water-splashing festival at the entrance of the College of International Education of Huaxi Campus to celebrate the happy new year. The students are dressed in festive costumes with special dancing. They splashed water and bless with each other. It is understood that water-splashing activities are traditional festivals in Laos, Cambodia, and Thailand, and splashing water is also a more sacred ritual. The students scatter the water on the other's head and shoulders to express their blessings and pray for each other in the new year. Before the event, Zhang Pengcheng, deputy secretary of party committee, delivered a speech, wishing everyone a happy holiday and wishing the students a happy life in China, wishing them good health and good luck! At the beginning of the event, the students played their own country songs on the stage to express their homesickness. With the joyful music, they began to chase each other and splashed water. The clean water represents the ability to wash away the bad luck of the past year, and will bring peace and good luck to the coming year. Later, they also began to apply colorful powder with their bodies, which may cool them down. The colorful powder symbolizes their colorful life. The live atmosphere was cheerful and pleasant. 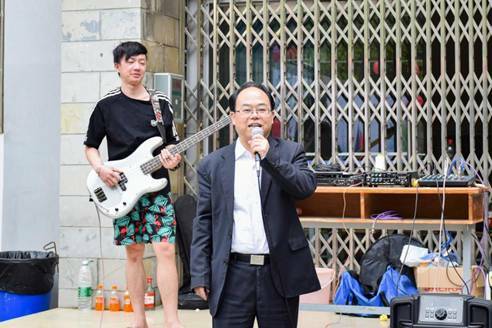 Zeng Li, the Dean of the College of International Education, said that the event not only let the foreign students who were in a foreign land feel the New Year atmosphere in their hometown, but also let everyone know the culture and customs of different regions, and also means that we respect the customs of their customs. In addition, it is an embodiment of the school's internationalization.